Need a patio cover for your entertainment area? A spa or pool shelter? At Sheds and Shelters we specialise in Formsteel Carports and shelters which are also ideal for a patio or deck cover, spa or pool shelter! They are an attractive design with minimal framing – no obtrusive beams or bracing and have the ability to clear span up to 6.0m! We have a large range of standard sizes available but can also custom design a size and shape to suit your outdoor area! Check out the range of standard sizes online here or contact us to discuss your situation! A patio cover is a great investment for your property as it allows you to utilize your entertainment area all year round! 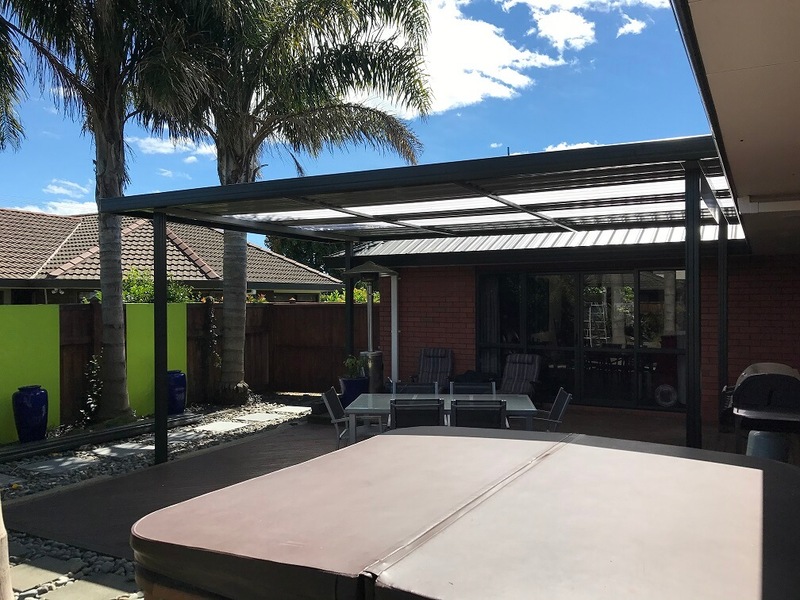 Your pergola will provide shade and protection from the harsh sunlight in Summer and rain protection in winter – enjoy your BBQ or morning coffee without the worry of the weather! Custom design service available – Width, depth and height can be easily modified! NZ made from NZ coloursteel – a product you can trust! Supplied in kitset pack for freight anywhere in NZ!